This look is pretty cool. The shot is very well captured as well. you guys need to update the blog more often! BTW, very pretty cute woman! I love her style! Very well-coordinated, cool and covered look. Masha'Allah! Always wondered what a hijabi on a bike would look like...never had the nerve to try it myself...now I know! I love the way she wears her scarf! AWESOME!!! everything about this ensemble is working for me - the striped oxford shirt peeking through, the bicycle and the white shoes...fresh! 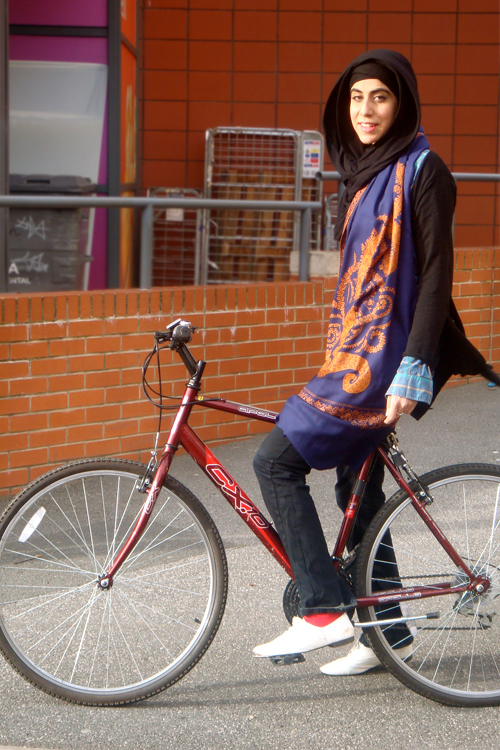 Yes, a biking hijabi! MaashAllah, I love her look! The bike here, is the best accessory! red socks and white shoes - wow! I love your kashmiri shawl and your white shoes ! As usual our Sum photographer strikes us with the color sparkling and unique style of our sisters! great shawl!!! and funky matching socks. creative & cute, mashallah...makes me want to organize a hijabi bike ride! I love the way she put on her hijab! I need to start looking for a tutorial on this style, do you know what its called? love the backdrop and how the brick colour is echoed again in the shawl and the socks.